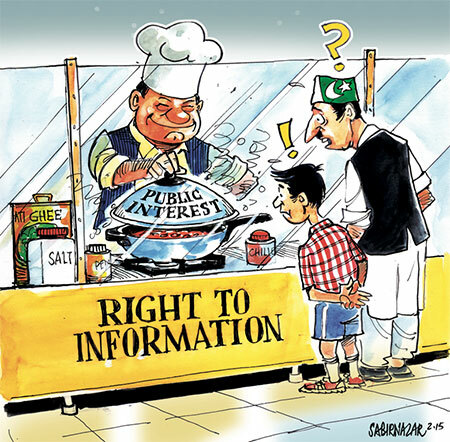 The Federal Government of Pakistan’s internationally acclaimed Right to Information Bill has yet to receive the long-awaited approval of the Cabinet, because of which it has not yet been tabled in the Parliament. Till the time the Bill remains off the statute books, the Federal Government and its attached departments follow the Freedom of Information Ordinance (FOIO) 2002, which is ranked a dismal 83rd on the Centre for Law and Democracy’s annual rating of RTI laws around the world. One of the reasons this Ordinance has been rated so poorly is the broad discretionary powers it grants the Federal Government under Section 8 (i) in prescribing which records may be disclosed and which must be withheld from the public. Still, it seems that the Federal Government no longer considers these powers sufficient. Two recent directives have seemingly increased the Federal Government’s discretionary powers under the FOIO 2002. 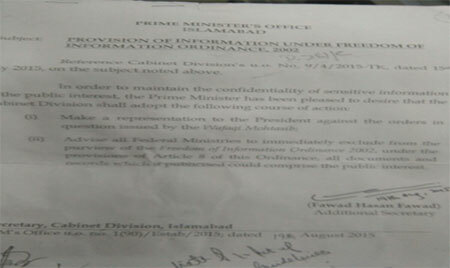 The first directive, which was supposedly issued from the Prime Minister’s Office on August 19 (PM’s Office u.o. no. 1(90)/Estab/2015), under the subject “Provision of Information under Freedom of Information Ordinance, 2002”, advises all Federal Ministries to “immediately exclude” from the purview of the FOIO 2002 all information which could compromise the “public interest” if publicized. The second directive, quoted extensively in Mr. Ansar Abbasi’s report in the News dated October 04, 2015, was reportedly issued on September 08 to all Federal Ministries and attached departments, which also advises the exclusion of all records from the purview of FOIO 2002 if their disclosure could compromise public interest. The report mentions that this directive was issued in response to a public request for information on the nature of gifts given by foreign dignitaries to senior public officials. After initially being denied by the Cabinet Division, the requester forwarded a complaint to the Federal Ombudsman of Pakistan, which ruled in his favour. It is alleged in the report that the Cabinet Division’s abovementioned directive was issued to provide the Federal Government cover for not complying with the Ombudsman’s order. Since the finalization of the acclaimed draft Right to Information Bill, the Federal Government has repeatedly reassured the public of its commitment towards RTI. Its commitment is also evident from the fact that the party, the PML-N and its Government in Punjab have, since 2013, legislated and implemented an internationally acclaimed Right to Information law in Punjab. The directives, if issued, appear to be ill-advised and cast negative light on the Government’s acclaimed commitment to right to information. The Government is urged, once again, to urgently present the draft RTI bill to the Parliament for its passage and promulgation. In an encouraging development, the Senate of Pakistan stressed the need for an effective RTI law at the Federal level to ensure the complete accountability of government. Speaking during a sitting of the Upper House held on Tuesday, October 06, 2015, Chairman of the Senate, Mian Raza Rabbani said that accountability should be ensured across the board and no particular exemptions should be granted to any segment of the bureaucracy. Adding to the discussion, the Honourable Senator Farhatullah Babar reminded the House that the Federal RTI Bill has been awaiting the approval of the Federal Cabinet for over 18 months, a period in which over 15 Cabinet meetings have been held. The previous issue of this Monitor contains a list of dates when these Cabinet meetings were held. On October 20, 2015 PILDAT sent its first information request to the Directorate General of Public Relations (DGPR), Punjab to obtain a month-wise breakdown of the Provincial Government’s expenditure on promotional advertisements published in the print and television media between January 01 and October 20, 2015. The DGPR releases and makes placement of advertisements by all departments of the Provincial Government of Punjab, as per the Advertisement Policy, 2012. According to the same policy, the DGPR also releases payments for advertisements promoting campaigns and schemes of all government departments, bodies, authorities and corporations in Punjab. PILDAT has sought access to these records under Article 19-A of the Constitution and the Punjab Transparency and Right to Information Act 2013. As per the RTI Act in Punjab, the DGPR confirmed receipt of the information request on November 02, 2015. It is hoped the Directorate will either provide the requested information in the time-period prescribed in law, or invoke one of the legitimate exceptions in law under which disclosure may be withheld. Rejecting the argument put forward by the Deputy Secretary of the Punjab Governor House Mr. Tariq Shehzad, the Punjab Information Commission (PIC) ordered the disclosure of expenditure-related records on October 14, 2015. Mr. Waseem Abbasi submitted the initial request to the Governors House Secretariat on September 18, 2014 and was denied access to the requested information. Mr. Abbasi filed a complaint to the PIC, citing the Deputy Secretary as respondent. This complaint was upheld in a February 12 order issued by the Commission. When this order was disregarded, the Commission issued a show-cause notice to the Deputy Secretary on March 03, 2015. In response the Commission received a letter from the Secretary to the Governor, Mr. Farhan Aziz Khawaja, calling into question its February 12 order. The Commission on April 15, 2015 unanimously rejected the objections raised in this letter and once again ordered disclosure of the requested information. The PIC later amalgamated this complaint with two other complaints against the Governor House Secretariat since the arguments put forward by the respondent were similar in all three cases. 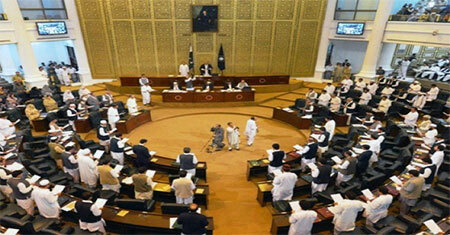 Unlike the Secretariat’s of the National Assembly of Pakistan and the Provincial Assembly of Punjab, the Secretariat of the Provincial Assembly of Khyber Pukhtunkhwa (KP) has yet to publically disclose the attendance records of its MPAs through its website. It bears mentioning that PILDAT has already recommended that the Provincial Assembly should share its attendance records online in its Scorecard on the Provincial Assembly of Khyber Pakhtunkhwa: The Second Parliamentary Year, which was published in July 2015. Unfortunately, the Assembly has not yet acted on this recommendation. This is a matter of concern as the Provincial Assembly of KP and its Secretariat are both designated public bodies under the KP Right to Information Act 2013. Even though the Provincial Assembly was removed from the ambit of the Act on June 23, 2015 through a controversial amendment this change was repealed on September 10, 2015. Despite enough time having passed since then, the website of the KP Assembly has not been updated with the attendance records of MPAs. In comparison, the National Assembly of Pakistan’s website has been regularly updated with the attendance records of MNAs dating back to June 05, 2015. Attendance records of MPAs updated on the Punjab Assembly website date back even farther, till February 10, 2015. The Prime Minister’s Office of India under Mr. Narendra Modi has reportedly been refusing to disclose information on the PM’s foreign visits despite receiving numerous RTI requests between June 2014 to June 2015 This is considered highly irregular in India, a country with the third-best RTI law in the world. In fact, India’s RTI Act 2005 explicitly requires the disclosure of information pertaining to the nature, place and period of the Prime Minister’s foreign and domestic tours. Despite these clear provisions, the Prime Minister’s Office website has only been updated with details on Mr. Modi’s first visit to Bhutan in June 2014. Details on the remaining 28 foreign visits undertaken by Mr. Modi have yet to be provided online. In comparison, the Prime Minister’s Office website has details on all 19 foreign trips undertaken by Mr. Atal Bihari Vajpayee between 1999 and 2004. The website also contains details pertaining to 68 out of Mr. Manmohan Singh’s 73 foreign visits between 2002 and 2014. Protesting against the curbing of civil liberties under Mr. Modi’s Government, prominent activists at the helm of India’s pathbreaking movement for RTI have boycotted official celebrations of the ten-year anniversary of RTI in India. 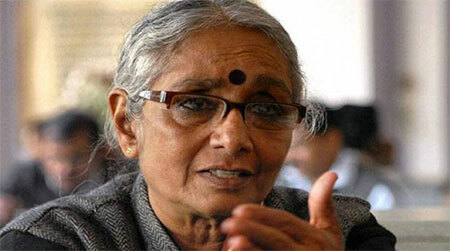 These include founding members of the National Campaign for People’s Right to Information (NCPRI), Ms. Aruna Roy and Ms. Anjali Bhardwaj, along with the co-founder of the Mazdoor Kisan Shakti Sangathan (MKSS). They have accused the Modi Government of preparing intelligence profiles on RTI activists and selectively sending out invitations for the ten-year celebration. They were of the view that such measures had never been taken under previous governments. 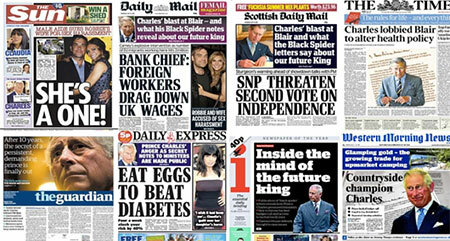 During an October 29 review of the UK’s Freedom of Information (FoI) law in the House of Commons, Leader of the House and Conservative Cabinet Minister, the Honourable Chris Grayling, stressed the need to control growing ‘misuse’ of the law by the media. Mr. Grayling felt the law should be changed to curtail its use as a ‘research tool’ for new stories by the media, a practice that he termed unacceptable. Mr. Grayling’s remarks have received condemnation by representatives of the Labour Party, civil society and the media. Mr. Tom Watson, Deputy Leader of the Labour Party, has criticized Mr. Grayling’s remarks and asserted that the FoI law is a powerful tool in the hands of citizens and media for holding government accountable. He also alleged that Mr. Grayling’s remarks betrayed a preference by him and his party for less open government. In the same vein, Maurice Frankel, the director of the Campaign for Freedom of Information, has said that it is perfectly normal for journalists to use FoI to generate stories on issues of public importance, and termed this practice as a vital source of public information on government. Similarly, Matt Burgess, a columnist for the Guardian, wrote a story published on October 30, 2015 listing 103 examples of well-received public interest stories published in the first-half of 2015, which would not have been possible without the FoI Act. Despite the inclusion of Goal 16.10 on access to information in the UN Draft Resolution on Sustainable Development Goals, the Goal itself was not discussed during a recently concluded UN meeting in Bangkok, Thailand. Discussion on the indicators for this Goal was explicitly ruled out during the meeting despite the recommendations of United Nations Educational, Scientific and Cultural Organisation (UNESCO), the World Bank and representatives of Non-Governmental Organisations (NGOs) in attendance. According to the UN, discussion on Goal 16.10 was ruled out due to lack of consensus between member states on the Goal’s proposed indicator. An NGO representative, Mr. Bill Orme, has warned that if consensus on Goal 16.10 is not generated soon there is a danger that measurable indicators for the Goal are entirely left out of the Post-2015 Global Development Agenda.